With Game 4 Win, Heat Even Championship Series Against Spurs : The Two-Way The game served as a dazzling display for Miami's Big Three, who had an offensive awakening. Game 5 is in San Antonio, before shifting to Miami for the home stretch. LeBron James of the Miami Heat goes up for a shot against Kawhi Leonard of the San Antonio Spurs during Game 4 of the NBA Finals at the AT&T Center in San Antonio on Thursday. 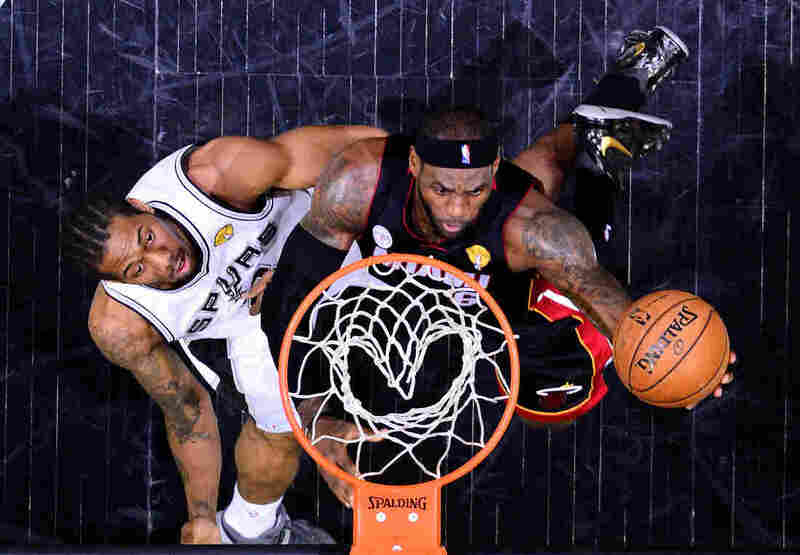 With a 109-93 win, the Miami Heat evened their championship series against the San Antonio Spurs on Thursday night. "Dwyane Wade, Chris Bosh and LeBron James combined to score 85 points on Thursday in the Heat's 109-93 victory against the Spurs at San Antonio's AT&T Center to tie the NBA Finals at 2-2. Game 5 is on Sunday before the series shifts back to Miami for the grand finale. "Miami's Big 3 was averaging a combined 43 points in The Finals before Game 4's offensive explosion." ESPN described it as an "oh" game. "Like 'oh, that's why this team won the title last season.' Or 'oh, that's how they won 27 games in a row.' Most appropriately, though, it was 'oh, that's the Wade that's going into the Hall of Fame,' " ESPN reported. Sunday's Game 5 is set for 8 p.m. ET. ABC-TV is the broadcaster. In more serious news, about two dozen fans who were watching the game on TV at a waterfront grill in Miami Thursday night were injured when a patio deck gave way and spilled the fans into Biscayne Bay. "As many as two dozen people were injured. By 11:20 p.m., 15 people had been transported to various hospitals, two of them in serious condition, said Miami-Dade Fire Rescue Capt. Eugene Germain Jr. Another fire captain said one person might be missing and that a search was underway as rain fell."